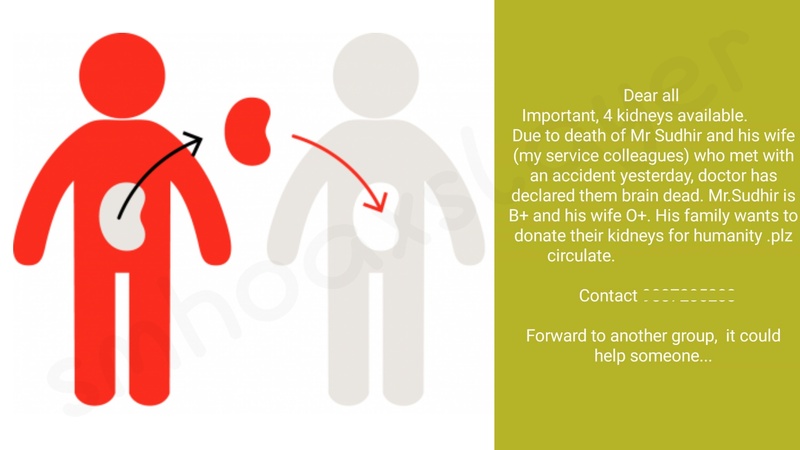 A Message offering 4 kidneys is viral. Aug 2018 – This was wrong too. चार किडनियां दान हेतु उपलब्ध हैं। स्व सुधीर (बी+) और उनकी पत्नी (ओ+) की सड़क दुर्घटना में मृत्यु से पूर्व उनकी इच्छा के अनुसार ये महत्वपूर्ण दान कोई भी प्राप्त कर सकता है। चिकित्सकों ने उनके मस्तिष्क को मृत घोषित किया है। संपर्क करें: 9837285283 ! The Mobile Number belongs to a Nephrologist in Meerut, Dr. Sandeep Garg. He had this issue since September 2017, he tried filing a Police complain but on their suggestion filed a complain to the cyber cell. He doesn’t want to disconnect this number as he has been has this number since last 13 years and almost all of his patients has the same number. He believe someone gave out his number in such a way as a prank or to harass him. Further, Sharing/forwarding such message i.e. Organ Donation is illegal/crime as per Human Organ Transplant Act-1994. Did Shahrukh Khan donate 45 crores to Pakistan burn victims ? January 10, 2019 Amandeep Comments Off on Did Shahrukh Khan donate 45 crores to Pakistan burn victims ?